These purple beauties were transformed into Miso Chili Glazed Eggplant when they were slathered with a delicious sauce made with the combination of miso paste and gochujang sauce. Miso paste is a fermented soybean which is often aged anywhere between 6 – 36 months. It adds a rich and deep flavor to sauces, soups and marinades. Gochugang, is a fiery red pepper paste made with Korean chilis and it is quickly becoming a very popular and trendy kitchen ingredient. When I was at the Specialty Food Show in NYC recently, gochujang spiced food items were popping up everywhere. If you haven’t yet tried gochujang, it is worth buying. Although difficult to pronounce, gochujang is becoming more available at typical grocery stores and will most likely be found in the Asian food section. Because both ingredients are fermented, miso paste and gochujang sauce will last in your refrigerator for quite a while, so keep them handy and start to add a bit on all types of dishes. Heat the oven to 425º. In a small bowl, whisk together the sesame oil, mirin, rice wine vinegar, miso paste, gochujang sauce, and honey. After it is smooth, set aside. Slice the eggplant in half, lengthwise, leaving the top stem on (I think it presents prettier this way). Sprinkle the cut surface of the eggplant with a bit of salt and let them sit for 10 minutes. Using a small paring knife, score the open cut side with a knife in a zig zag manner, taking care not to cut the eggplant all the way through. (see photo). 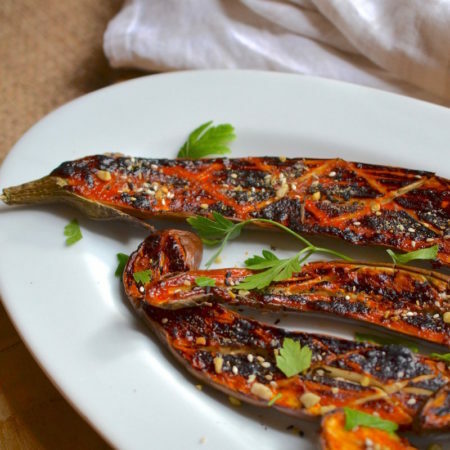 The purpose of this is so the miso glaze can penetrate through the fruit - I know, most people consider eggplant a vegetable, however because of its seeds, it is actually a fruit. Brush the miso chili glaze over the surface of each eggplant half. Using a baking tray, place them into the oven for 7-10 minutes. Now set the oven to broil to gently brown the tops. Keep an eye on the oven so they don't burn. Once they have browned just a bit, remove from the oven. These can be served warm or at room temperature. In a small bowl, whisk together the olive oil, rice wine vinegar, honey, pinch of salt, and 1 tablespoon Penang nut & spice mix to make the dressing, then set aside. In a large mixing bowl, toss together the cauliflower rice, fresh parsley, and fresh mint. I bought my cauli rice already pre-chopped and bagged from Trader Joe's, however, you can also buy a whole cauliflower, cut it into florets and pieces, then pulse it in a food processor until you achieve small, rice-like pieces. A full head of cauliflower will yield lots of extra rice so you can store it away and use it in other dishes. Pour the dressing over the cauliflower/herb combination and toss to incorporate well. Set aside to marinate while you are making the jasmine rice. You can cook the white rice with vegetable stock, coconut milk or just water. Follow directions on the package for rice and once it is cooked, lift the lid to cool completely. Toss 2-3 cups of rice in with the cauliflower mixture and set aside to meld with the flavors of the dressing. To serve the eggplant dish, lay a bed of cauliflower jasmine rice onto a large serving platter. Arrange the miso glazed eggplant over the rice and sprinkle with Penang nut & spice mix. Top with fresh chopped herbs (mint and parsley) and coarsely chopped peanuts. This can be served warm or at room temperature.